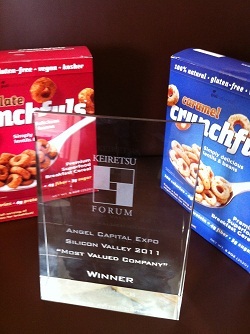 Pul Foods Inc., makers of Crunchfuls cereals and snacks wins the “Most Valued Company Award” at the annual Keiretsu Forum 2011 Angel Capital Expo at Microsoft Conference Center, Mountain View, CA. The voter included 300 members and guests of Keiretsu Forum including leading venture capitalists, angel investors and executives of high-tech industry. Other presenting companies included technology, solar, life sciences, real estate, lifestyle and consumer goods. Company founder and CEO, Dr. Deepa Shenoy presented the angel funding opportunity to investors. “We are excited that our company was recognized as the Most Valued Company by Keiretsu Forum’s investment community. Our agriculturally-sustainable vegetable-based food products made with pulse-legumes (beans and lentils) will positively revolutionize the US and global cereal and snack industry” Dr. Deepa said “with healthful, affordable and sustainable conventional foods”. Crunchfuls consumers understand the value of replacing low quality whole-grain-based ingredients such as bran, soy grits and corn with superior protein, fiber and complex carbs from of pulse legumes (beans and lentils)”. Pulse legumes or Pulses are the primary ingredient of Crunchfuls. Pulses are soil-enriching and water conserving crops that help enrich the soil and decrease the use of artificial fertilizers and pesticides during crop rotation with grain or oil crops. Pul Foods Inc is the inventor and manufacturer of Crunchfuls line of vegetables-based ready-to-eat product line, made from pulse-legumes (lentils and beans) sold in approximately 50 retail locations in the San Francisco Bay Area and nationwide through the company website (www.crunchfuls.com). Keiretsu Forum (www.keiretsuforum.com) is the world’s largest network of angel investors with over 850 accredited investor members throughout 21 chapters on three continents. Its members have invested over $200m in over 260 companies in technology, consumer products, healthcare/life sciences, real estate and other segments with high growth potential. 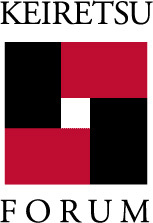 Contact: Keiretsu Forum Staff at (info@keiretsuforum.com) or (925) 283-8829.